Our goal is to help you speak English clearly. Our goal is not to make you speak as well as Queen Elizabeth. You want to be understood and having a little bit of accent is perfectly fine. How to pronounce the final "-ed"
Focus on the ends of words. The biggest problem with English for many ESL students are the final sounds of English words. This is an especially difficult problem for Spanish speakers and Chinese (Manderin or Cantonese) speakers in Calgary because their languages have different structures than English. The Spanish language and the Chinese language have very different 'phonological' structures. The best example (worst example?) is the sound of final /-ed/ for the Simple Past. Spanish, Portuguese, Mandarin and Cantonese don't have /-ed/ at the ends of words; therefore, it is super hard for you to say them in English. Yes, English is crazy. I'm sorry. Another example of 'crazy English' is the final /-s/ that is added to English words. The /-s/ at the end is also hard for many ESL students. Spanish has /-s/ at the end, like in /los/ and Carlos/ but you don't have /-s/ grouped with other sounds like at the end of these words, like in /asks/ and /carts/ and /needs/. And actually, if you watch the video below, when English people say /-s/ at the end, it usually isn't an /-s/!! Most of the time it is really /-z-/. Every little bit helps. Try to improve your "th" sounds; just stick out your damn tongue and it will sound perfect. Also, we mush together many words. So watch out for contractions like "wanna" (want to) and "gimme" (give me) and others. Plus, you need to watch out for silent syllables and stress on different syllables. Still have questions about ESL or English?? Want to talk about these videos?? Watch these or get a private tutor. Watch the video and tell your tutor what you saw. 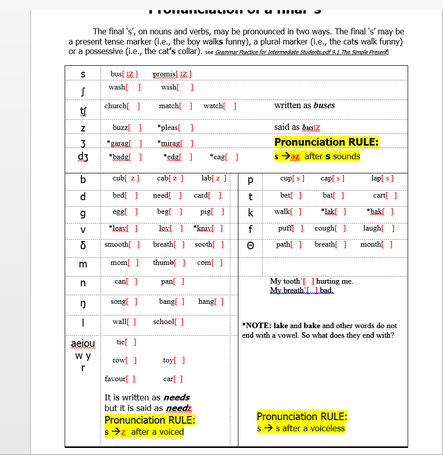 Final/-s/ -- download the chart for speaking English more fluently.